How did you celebrate International Women’s Day? This time last week I attended an event held at a 1940s art deco venue near my home in Melbourne. 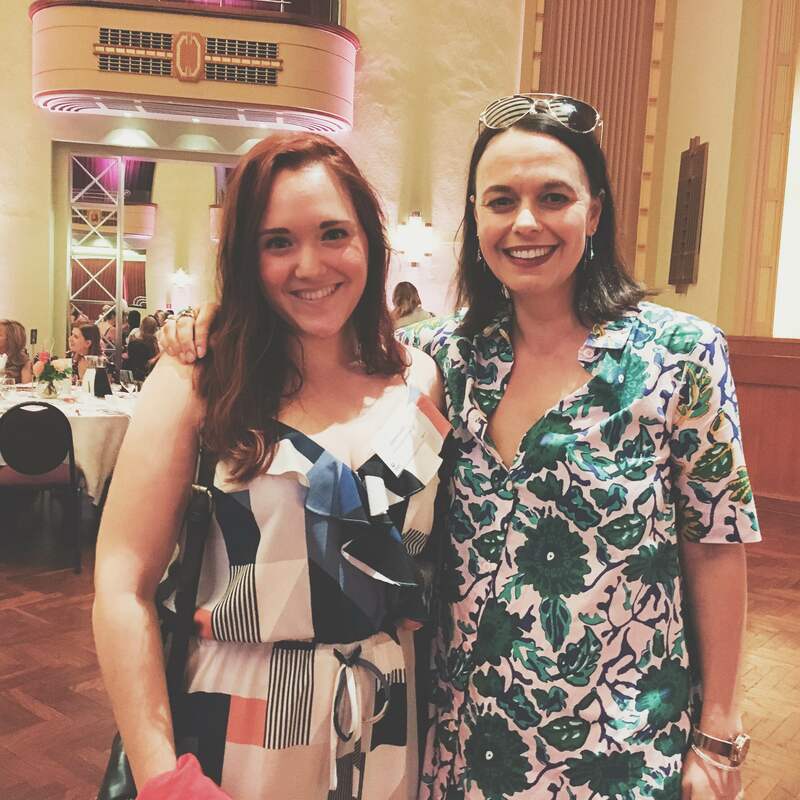 What made the day extra spesh was the luncheon’s main star attraction – the Co-Founder of The Mamamia Women’s Network, Mia Freedman, who also happens to be one of my favourite people. Not only is this amazing human being one of Australia’s most notable faces, she’s also a mum of three and one inspiring media pioneer. The day was definitely an all-pink affair with glorious lighting and feminine floral table arrangements. Expectedly, it was a full house filled mostly with women from all walks of life. Like the delicious set menu, Mia Freedman did not disappoint. Before she even stepped on stage, Mia gave all those in her presence her undivided attention (which we later learnt was a trait picked up from her mentor, Lisa Wilkinson). She was inundated by those keen to meet her so they could grab that all-important selfie –myself included. She was so obliging that she took the initiative each time by grabbing each fan’s phone to ensure the all-important happy snap was captured. If you thought she couldn’t get any more awesome, she addressed all of us by name (we had name tags) when introduced and gave each of us incredible eye contact. Definitely beyond the call of duty. Naturally as I sat back down at my designated table, I felt like a million bucks. So what did Mia have to say for herself? A lot. As many speakers before her, she had slides featuring images as well as the occasional video, but did she have a speech written up? Nope. Why would she? She’s Mia Freedman. The woman can talk and very eloquently too. She commenced her speech with a promo video which highlighted what makes Mamamia tick. The clip did not disappoint. In fact, I reckon at least half the women in the room would have dreamed they all worked for Mia. After all, she’s a pretty cool chick. After giving her introductions, Mia proudly shared Mamamia’s core mission: To empower, empathise and entertain (women and girls of course). She then went onto reveal the one key ingredient she believed aided Mamamia’s climb to the top – her ability to “look back at [herself and her brand] through the eyes of the consumer.” In essence, walking in their shoes to ensure she was always on the mark. Mia attributes a lot of her success to Lisa Wilkinson from the Today Show. We all know Lisa is an incredibly talented journalist and media personality, but did you know that at the age of 21 she was the Editor of Dolly Magazine? An incredible feat to say the least. At age 24, Mia became Editor of Cosmopolitan Magazine, and as a profound feminist she introduced a “Body Love Policy,” meaning every edition of the magazine had to feature women of all shapes and sizes. Hats off to Mia. Like every one of us, Mia’s life wasn’t full of fresh flowers and glorious smiles, she had her fair share of ups and downs. Mia had to master the juggling act as she fell pregnant a few months into gaining the prestigious role at Cosmo. But as soon as she gave birth, her partner Jason developed Chronic Fatigue Syndrome which took hold of his (and her life indirectly) for two years. Mia admitted that she “had her foot on the accelerator.” After her husband got better, she felt pregnant again, got married and shortly after had a miscarriage. The loss of her little baby girl came with a usual sense of grief. She felt “an incredible sense of failure as a mother and as a woman.” A year later she separated from her husband. There was light at the end of the tunnel for Mia. After ongoing therapy, she and her husband Jason got back together. As she said this, there were many ‘awwws’ in the room (lots of love for Mia). Mia eventually was promoted to Editor-In-Chief of Cleo, Dolly and Cosmo. She then fell pregnant again, and as her life was reaching a new gear, the world of magazines was being left behind. She moved into TV but the new venture only lasted seven months. She negotiated her redundancy and started Mamamia as a blog which like today covers parenting, gossip, lifestyle and fashion. It’s always dangerous territory when “we compare ourselves to what we see online and in magazines which is usually doctored and stylised.” Mia encouraged us to always remain raw and authentic. Mia pushed one point throughout her speech. In business, it’s imperative to “know your why. Why you do what you do.” She suggested we all watch a Ted Talk by British-born entrepreneur, Simon Sinek. She then went onto say that “your ‘why’ is what makes you unique. Your core purpose as a business and the actions you take is led by your intention”. Mia then proceeded to give a whole series of short and snappy life lessons. Take notes. Finally, they “treat each individual like [he or she] is the only thing in their day.” A lesson learnt from Lisa Wilkinson when Mia was a work experience girl at Dolly Magazine all those years ago. And I got to experience this first hand from Mia today. Considering Mamamia’s audience grows by 82% year on year, I think Mia is definitely onto something.